An extended essay about how elite colleges and universities are failing to serve students and society. Deresiewicz (A Jane Austen Education: How Six Novels Taught Me About Love, Friendship, and the Things that Really Matter, 2012, etc.) received an elite education at Columbia University and taught at both Yale and his alma mater. The author uses his experience to deliver an indictment of top-tier higher education, especially regarding undergraduate students. Deresiewicz does not advocate that intelligent, motivated students eschew a college degree. Instead, he presents a program for how the students, their parents, government officials and the private sector can push college administrators and professors to graduate truly educated citizens. The author is unrelentingly critical of students who attend college just because it is expected or might increase their future incomes. 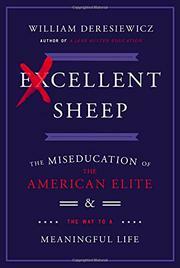 In the author’s opinion, most elite college educations are merely extensions of elite high school educations, with students more interested in good grades and resume padding than in finding their true passions. It’s likely that the author will reach readers who confirm his dark critique of American higher education, but it’s just as likely that the book will find detractors—not only due to its deep pessimism, but also due to the author’s selective supporting evidence. When Deresiewicz states that elite colleges "do little or nothing to wake students up from the values and habits they bring with them from high school,” he offers little more than weak circumstantial anecdotes. Many of the author’s anecdotes are interesting case studies, but even those are often presented only superficially. Deresiewicz’s desire for change is admirable, and he is not mistaken about the many problems of higher education. This book has its genesis in an essay published by the American Scholar, an essay the author describes as "cranky." While expanding that essay into a book, the author falls into repetition that might be construed as padding. An unquestionably provocative book that hopefully leads to productive debate.